One such person who had a business idea and decided to just go for it is our interview guest Josh Cohen, the CEO of The Junkluggers, which is an eco-friendly junk removal company. As Josh stated during our interview, “everybody’s got junk.” Unlike other people, though, Josh found a way to make money from everyone’s junk. After all, one man’s junk is another man’s treasure. Josh started The Junkluggers out of his mother’s Dodge Durango in Trumbull, CT when he was a fresh 21-year-old Business Administration graduate of the University of Connecticut. Through his junk removal business, he found a way to indulge his passion for the environment and utilize his marketing savvy in order to satisfy his entrepreneurship ambitions. And there is no doubt that Josh has worked hard to build a strong company culture to elevate the company he founded to what it is today. He still continues to see his vision through every step of the way. His company, which has a presence in at least eight states, specializes in the removal of junk, furniture, and trash, as well as the donation and recycling of items that can be reused. So, in this interview, we explore the strategies that Josh has used to start and grow his business to the level it is now. We’ll highlight some of his tips below, but make sure to listen to the whole interview for even more advice. In the beginning, Josh tried to run his junk removal business while working mainly as a real estate agent. In the end, that didn’t work out so well. It’s when he decided to follow the advice given to him to focus on the junk removal business that he really began to enjoy the fruits of his labor. There is such a thing as burning a candle on both ends, and it never ends well for anyone. By focusing on what was important, Josh was able to concentrate on his core business operations, which led to phenomenal business growth. It’s, therefore, important that you concentrate on your core business operations if you want to grow a successful business. Selectivity: According to Josh, he wasn’t interested in just anybody. He took the time to screen the people who would become his employees because he valued his clients. After all, the employees he hired will have to deal with the clients on a daily basis. So screening matters. Training: Josh Cohen took the time to train his people. He believes that people aren’t dogs who should be expected to simply follow instructions. Instead, he took the time to engage them and teach them what was expected of them. Employee Engagement: One of the greatest things about Junkluggers is the way employees are treated. The company CEO has worked hard to develop a positive company culture that includes office parties and barbecues. This kind of environment enhances the working relationships in the organization and creates a motivating force for the business. Who doesn’t want to work harder for a company that values personal contributions?
. 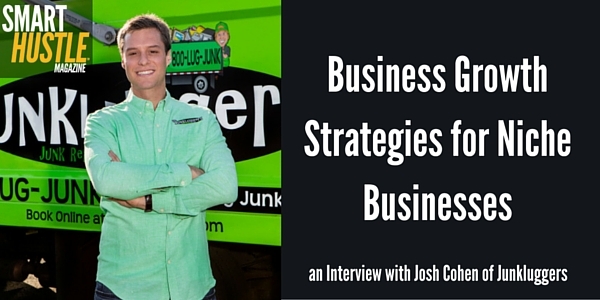 @Junkluggers CEO shares great #business #growth advice in this @smarthustlemag interview. When it comes to junk removal, understanding the customer’s situation is essential. Sometimes people want items to be removed because they are moving or are facing death in the family. Each situation requires a unique, customer-focused approach. Josh believes that customers are important. He encourages his employees to take the time to talk to his clients when they need to confide in someone. This attitude goes a long way in enhancing customer care service and ensuring that clients are happy. And you know what? Those clients will not forget the little bit of kindness shown to them. That, in a nutshell, is what makes referral marketing very effective. There’s plenty of good advice that Josh Cohen gives in our interview. You would do well to tune in, in order to learn what works for his business and how you can use his business growth strategies in your niche business.